There are just over 32,000 Police Officers in London and only approximately 10% are armed officers. It is currently illegal for any security guards in the UK to be in possession of a weapon. However, the Guard Dogs Act of 1975 provides for the use of dogs to guard a property, provided the dog is under the control of a handler. 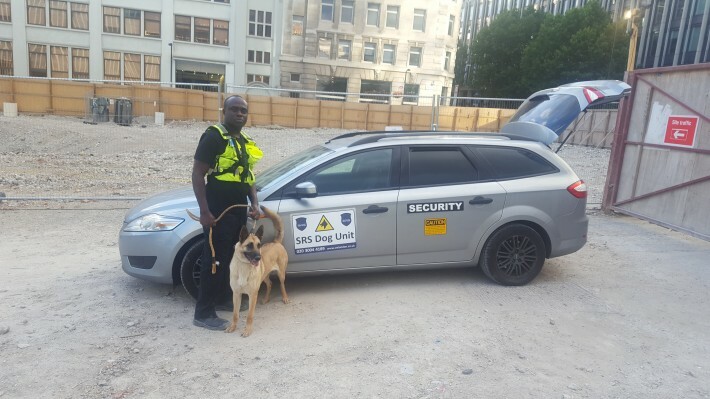 Our well trained and equipped security dog handlers can be trusted to deliver excellent and reliable service throughout the day and night. All the security dogs and handlers are fully vetted, licensed and expertly trained. Dogs are trained to protect the handler, and therefore allow the guards to safely challenge an intruder. Under instruction from a professional security dog handler, a dog offers an additional deterrent to ward off trespassers and prevent security breaches. At SRS we know from experience that often the visual deterrent of a guard with a dog is enough to put most criminals off! SRS also encourages the use of body cameras on guards working in isolated areas or vacant sites. These give us a visual and audio record from the Point of View of the guard. The combination of guard, dog and body camera working together are a powerful deterrent.